Funny how added complexity increases development timeframes. Your timeline a way off, especially the "will be a capable fighter in 10 years time", unless you think the USMC decision to declare IOC at Block 2B was premature. btw, They ALWAYS intended to declare IOC before the USAF with Block 2. If you look at ANY of the new modern fighters of the last 20+ years, they all took over a decade to develop mainly due to the complexity of the program (software, avionics, etc). This applies to the F-22, F-35, Rafale, Eurofighter, etc. ...and how many Viper Blocks? Let me count the ways -- 1, 5, 10, 15, 20, 25, 30, 40/42, 50/52, 60...and different sub-configurations within many Blocks. Wasnt much hanging on a Block 1 Viper either -- compare to a Block 60. Compare a Block 60 to a Block 2b/3i F-35. From talking to the pilots who have flown both, I can tell you which one they'd rather fly. laos; the biggest difference is simply that in the 70s and 80s, the test process was fraught with far less red tape and worked on many more assumptions (eg; "missile X launches fine while next to bomb Y, therefore it should launch fine while next to bomb Z"). In modern systems testing, you have weapons being coded for, etc, then being computer simulated to see how they would be launched, then dropped on the ground into soft pits to see that they match the models, then the models are tweaked, the weapons are carried up, vibration tested, the aerodynamic effects closely mapped, etc, then you do weapons drops, tweaking the pneumatic launchers / setup to make it work best, then you do launches under more strenuous conditions, do more tweaking, do weapons accuracy tests, etc. Adding to the fact that the F-35 now has to test and cert for the entire munitions inventory. How many weapons were there back in the 70's that the F-16 had to employ compared to 2015? Before spouting off ignorance laos, read into the why. I admit that in field of aircraft testing and software development I am ignorant. Your comments shed a new light on the problems which I was not aware off. All that is true, but don't get the idea that a bunch of cowboys from Fort Worth just hung random weapons on the F-16 at random hardpoints, and dropped them at random conditions without extensive analysis and ground test. USAF provided GD with an initial list of takeoff loadings and normal downloadings to be cleared during FSD tests. Two air to air, seven air to ground, and a ferry loadings were specified. Air to air loadings were two or four AIM-9L, with and without 370 tanks. Air to ground included Mk-82, Mk-84, GBU-10, GBU-12, AGM-65, CBU, and SUU-20/BDU in various combinations. The same process Dragon029 described was followed to clear inflight ejections, except there was no coding, and weapons were not just dropped into sand pits, they were ejected with specified cartridges, and the carts were "tweaked" on the ground to result in desired pitch rates. Dynamic loads measured on the ground were cranked back into the inflight load analysis to verify adequate strength. A significant number of flights were used to develop interval limits for MER ripple ejections, that were cleared, but never used in service (I was told). F-16 FSD flight tests began in February, 1974 and were essentially complete by mid 1975 for air to air and air to ground. We had the advantage of a much simpler airplane of course, but we also had a TEAM approach, where USAF and GD were both dedicated to getting the job done safely, as soon as possible. IOC was around August 1979 (ask Gums, he was there). USAF officials have said that the aircraft already boasts impressive electronic warfare (EW) capabilities, and more will be added as the threat evolves, said Maj Gen Harrigian. "We're doing a lot of things with EW," he said. "First you have to understand what the threat is and ensure that, as threats evolve, we're agile enough to show the pilot what that threat is. The second piece of it is, then, what kind of electronic attack [EA] capabilities do we have to take care of that, blind them, run them off to another target?" He added that new EW and EA capabilities will be integrated into the F-35 with both increment 3i and 3F software. The service intends to declare its jets operational with the 3i software on board. Senior Department of Defense officials have previously said that a new variable cycle engine could also be cut into F-35 production within the time frame that Maj Gen Harrigian addressed for the aircraft's first major modernisation. Asked whether the USAF will seek to integrate the new engine, he said that it is an option in about 10 years, but that it is not high on the air force's wish list at this time. He added that new EW and EA capabilities will be integrated into the F-35 with both increment 3i and 3F software. So not just 2B capabilities hosted on new processors, eh? Posted elsewhere but related to a potential Block 4 tie in, Advanced EOTS prototype could fly by next year as should outperform all current & planned systems. 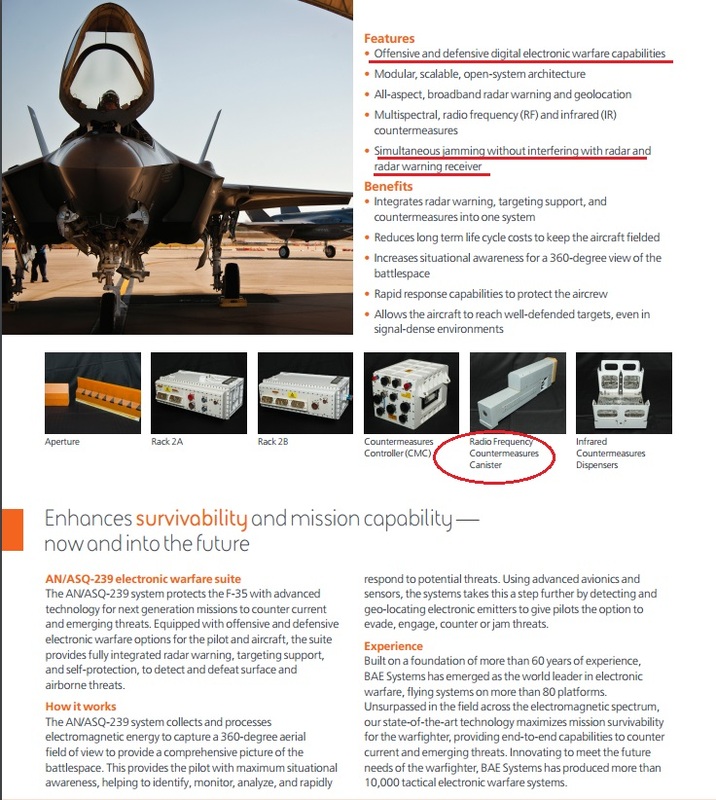 ....seems to be "replacement in kind/ in place"...tech interface upgrade for existing installed F-35 sensors and displays....? Since LM is fielding both A/EOTS and the Pod?, why could they not supply A/EOTS in two (port and starboard) fiber linked pods on the legacy teens for an upgrade? Maybe they lose a weapon station but gain the passive SA. Network it into the F-35 as more remote sensors? 1 pod is tolerable for drag, 2 is pushing it. Legion is meant to be hung on a centerline pod as well, meaning it can scan either side fairly well. "WASHINGTON — Lockheed Martin won an additional $18.5 million to continue work on developing an F-35 upgrade program, the Defense Department announced this week. The Pentagon awarded Lockheed a $18.5 million modification to a previously awarded cost-plus, fixed-fee contract for development efforts for the F-35 Block 4 modernization program, according to a March 28 announcement. ...The Block 4 modernization program is expected to cost $3 billion over the next six years. The effort will include upgrades to maintain viability against evolving threats, as well as a switch to a so-called open systems architecture that would make it easier to swap out sensors and other equipment on the jets in the future. Lt. Gen. Christopher Bogdan, chief of the F-35 joint program office, said earlier this month he expects a contract award for Block 4 in late 2018. He also said the Pentagon’s Joint Requirements Oversight Council will likely approve a road map for Block 4 this summer." The JSF is probably the most scrutinized program in the DoD and GAO wants to burden it with even more bureaucratic overhead? Bogdan said changes in cost, schedule and performance for Block 4 will not be "buried" because the Pentagon's acquisition executive has certain requirements he must approve for follow-on development. "We will have a separate contract on modernization; we will require separate earned value management reporting on that; [and] we will require separate cost, schedule and performance reporting from the contractors," he continued. "A government watchdog warned Congress that lawmakers could have difficulty holding the Air Force accountable for controlling costs during follow-on modernization of the F-35. The current joint strike fighter development effort is projected to end in 2017 when Block 3F developmental flight testing is completed, for a total development cost of $55 billion. The first increment of follow-on modernization, Block 4, is expected to add new capabilities and correct deficiencies. But the Government Accountability Office said the Pentagon’s plans could be problematic. “Without setting up the modernization as a separate program with its own baseline and regular reporting as best practices recommend, it will be difficult for Congress to hold DoD accountable for achieving F-35 Block 4 cost, schedule and performance goals,” Michael J. Sullivan, GAO’s director of acquisition and sourcing management, told lawmakers recently. “Although the requirements are not yet final and no official cost estimate has been developed for Block 4, DoD’s fiscal year 2017 budget request indicates that the department expects to spend nearly $3 billion on these development efforts over the next six years,” he testified before the House Armed Services subcommittee on tactical air and land forces. As of March, the Pentagon’s estimated total acquisition cost for the F-35 program is $379 billion, about $12 billion less than anticipated two years ago. But the aircraft continues to face affordability challenges, Sullivan noted. The program is expected to reach peak production rates in 2022, at which point the Defense Department expects to spend more than $14 billion a year, on average, over a 10-year period on the jets. Bogdan anticipates the Joint Requirements Oversight Council will approve the follow-on modernization/Block 4 capabilities development document this summer. “Work continues with the U.S. services and international partners to ensure the modernization program will be ‘right-sized’ for affordability and sustainability,” he said. Bogdan’s office will ensure that separate cost, schedule, performance and earned-value data will be available to provide detailed insight into program execution, he said." spazsinbad wrote: Firstly does anyone find it strange that this graphic goes with this story? F-35 program officials expect to have a Joint Requirements Oversight Council-approved Block 4 capability development document in hand by late this summer -- a milestone that will solidify follow-on modernization requirements and help set the foundation for the capabilities necessary to operate in the future threat environment. Diane Wathen, the joint program office's follow-on modernization director, told Inside the Air Force this week the program expects the JROC to approve its CDD in August or September. 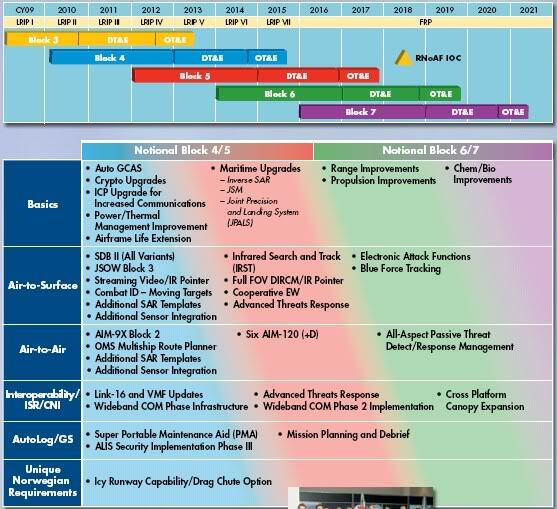 The document, which was established jointly by all F-35 partners, sets the framework for Block 4, the program's iterative upgrade plan that aims to deliver capabilities in four sub blocks -- 4.1, 4.2, 4.3 and 4.4. The CDD details the capabilities that will be featured in the first two sub blocks, Wathen said, and will be updated as the program approves the content of 4.3 and 4.4, which is still in the very early phases of being defined. Wathen explained that the follow-on modernization plan is not meant to expand the F-35's reach to new mission areas, but rather to improve performance within existing mission areas. "It's taking the mission areas we're in and expanding the capabilities to keep pace with the threat or bring improvements to the platform," Wathen said. 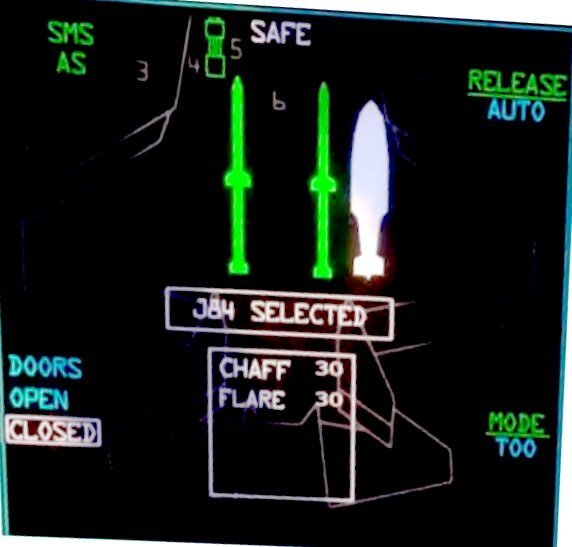 Capabilities in the 4.1 plan include electronic warfare improvements, cockpit navigation upgrades, a maritime identification capability for the radar and additional weapons integration including the Small Diameter Bomb II and the AIM-9X. 4.1 will also include Norway's JSM missile. The next sub block, 4.2, will bring interopability enhancements, including Link 16, and will begin incorporating an advanced electro-optical targeting system -- a capability that the Air Force has said is a top priority. Block 4 is not currently being designed as a major defense acquisition program and so does not have the same milestone structure as a traditional acquisition program. 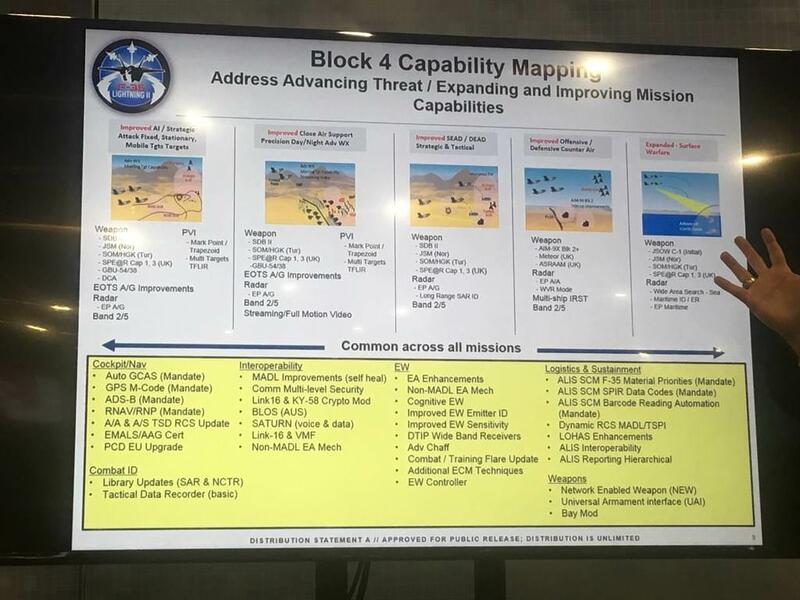 However, Wathen stressed that follow-on modernization will be managed under its own contract and many of the performance milestones are similar to what would be required under an MDAP -- they're just tailored specifically for Block 4. 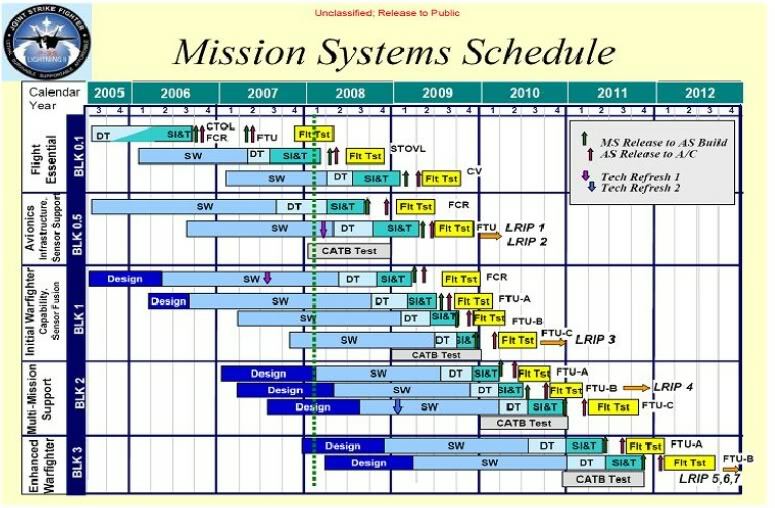 Under the current schedule, which Wathen reviewed with ITAF, the program expects to achieve preliminary design review for 4.1 in mid-2018. A milestone B-like decision point for the entire Block 4 effort is also slated for mid-2018, at which point the program would present an independent cost estimate and the Pentagon's acquisition chief would make a contract decision. Wathen noted that the program used an initial cost estimate to put constraints on the capabilities included in each sub block, but said the estimate will not be finalized for a few years. "That's a cost estimate prior to us going through any of the systems engineering activity, doing requirements decomposition and getting through a requirements review," she said. "It just helps to bound and prioritize." The 2018 contract decision will cover the full modernization program, Wathen said, establishing all of the terms and conditions that will apply to each sub block. The scope of each iterative upgrade will be defined separately, with separate RFPs and contract awards. "It's really a contract within a contract," she said. The program is working now to develop a Test and Evaluation Master Plan, which will also be completed in mid-2018. Wathen said as the JPO establishes testing processes and requirements, the Air Force, Navy and Marine Corps are conducting independent studies to analyze whether they have the capacity to test the capabilities in each sub block. "We're looking at both of those things to ensure that we have adequate test capability to support the content that's been laid out," she said. "That will evolve in parallel with us doing the test planning." Wathen noted that one lesson the program learned from the F-35 system development and demonstration phase was the importance of defining government ownership of the technical baseline as well as the test capability. She noted that those lessons will be prioritized in follow-on development. Once a contract decision is approved, the program will begin development of 4.1 -- a software-only upgrade expected for delivery in 2020. Future sub-block development will be staggered, with 4.2 starting in 2019, 4.3 in 2021 and 4.4 in 2023. The schedule also aligns upgrade deliveries with their respective production lots, with 4.1 inserted in lots 13 and 14, 4.2 in lots 15 and 16 and 4.3 in lots 17 and 18. The JPO began defining the scope of Block 4 several years ago, but in the last two years has narrowed its focus on working with partners to prioritize requirements. The program had expected to have an approved CDD last December, but that was pushed to this summer. Wathen said the extra time allowed officials to make sure the capability was well understood and to generate initial estimates of what those capabilities would cost. Wathen said because Block 4 requirements are established through the consensus of international and service partners, their priorities are weighted based on their investment, production quantities and some other factors. For common capabilities, partners were in relative agreement about what it would take to operate against future threats. And so setting priorities "was not really problematic," she said. The real challenge was cost, Whalen said, because as part of the Block 4 prioritization process, partners had to determine what level of investment they could make. "Part of looking at this was saying, 'What can the enterprise afford from a standpoint of capability content,'" Wathen said. "Budgetary reality is part of the process. It's either how much money do you have or how much are you able to get." With a contract decision on track for 2018, Wathen said her primary near-term focus is on setting the baseline for 4.1, which she said is the foundation for the rest of Block 4. That foundation is being set through a series of contracts the program awarded in the last year as part of the system requirements review process -- one last June and a second in February. She said there's another RFP being circulated with Lockheed Martin and other vendors that will carry the program to PDR in 2018. As it marked up the Defense Department's fiscal year 2017 budget request, Congress has made a few calls for changes to the JPO's management of Block 4. One provision would require Block 4 to be managed as an MDAP -- a proposal the JPO and DOD have said would add unnecessary cost and schedule delays. Another provision, first introduced by the Senate Armed Services Committee, would disestablish the JPO in 2019, at the start of Block 4, and turn over management of the modernization effort to the individual services. Addressing the second proposal, Wathen said that while it may be possible to disperse the unique capabilities among the services, the program would have to develop a mechanism for managing the common capabilities. "The unique stuff divides up," she said. "There would have to be an analysis of how you might divide up the common capability. It's not straightforward." Maybe McCain loses and the JPO gets to do it's work with less Congressional meddling. The way things are headed it may not matter whether McCain wins or looses, he might not be the SASC chairman. So what's the deal with Link 16? 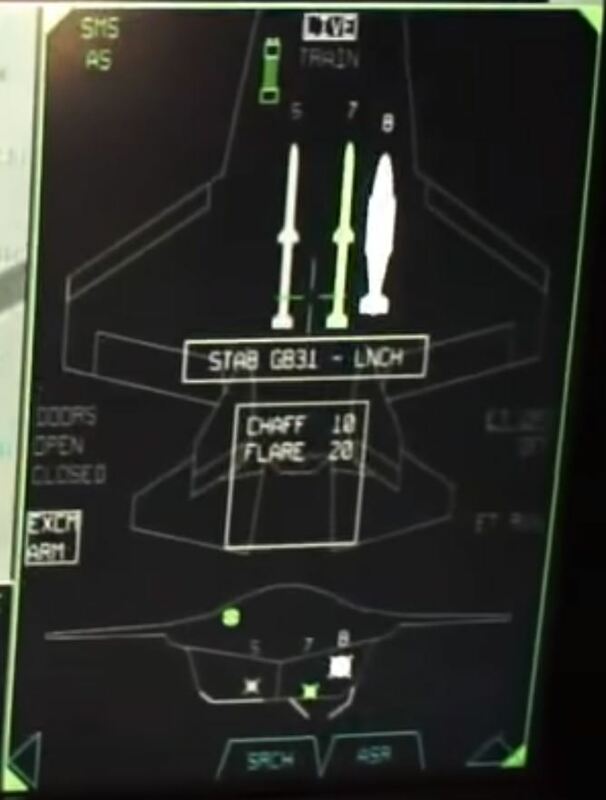 We know the F-35 can receive it, and I've seen a number of articles / documents stating that it can transmit on it as well; would this be a variation / extension of the Link 16 feature set or something, or will it (until Block 4.2) be like the F-22 with receive only? Here's one article that suggests that the F-35 can transmit via Link 16, but here's also an interview where a Netherlands pilot states that he can share data to F-16s and KC-10s via Link 16. Perhaps he was speaking hypothetically? The Link-16 in the F-35 is Transmit & Receive and always has been. SpudmanWP wrote: The Link-16 in the F-35 is Transmit & Receive and always has been. Yeah, it's the Raptor that is Receive Only IIRC but there are a number of 5th-to-4th alternatives in the offing. The current ones apparently focus on Link-16 to IFDL. Not sure if MAPS covers MADL as well to allow F-22 to F-35 communication. They were at one point exploring using the embedded arrays in both the aircraft for communication but don't know if that is still an option. Dragon029 wrote: So what's the deal with Link 16? We know the F-35 can receive it, and I've seen a number of articles / documents stating that it can transmit on it as well; would this be a variation / extension of the Link 16 feature set or something, or will it (until Block 4.2) be like the F-22 with receive only? I think upgrades to the Link-16 capability is probably what they are looking at. I recall something about a crypto standard improvement in the coming years for Link-16. "...For the most part, the services have finalized which capabilities will funnel into the Block 4 modernization program but are deliberating when those upgrades will funnel into production, Davis said. A capabilities development document is working its way through the Air Force and will go to the Joint Requirements Oversight Council later this summer, said F-35 program executive officer Lt. Gen. Christopher Bogdan. The current plan is to separate the Block 4 upgrades into four increments. Those capabilities will be integrated into the F-35 every two years, starting in 2018 with the first delivery of new capabilities in 2020. The F-35 joint program office (JPO) estimates the upgrades will cost somewhere around $3.8 billion to $4.8 billion to procure and integrate into the aircraft. That doesn’t include unique international requirements such as Norway’s joint strike missile. All weapons, including SDB II, will be fielded within the first two increments, Bogdan said. Other upgrades will include more modern electronic warfare systems, radar, avionics and interfaces, and changes that improve the aircraft’s reliability, maintainability and ability to deploy. Generally speaking, the JPO will look to current contractors for Block 4 systems, but could compete capabilities if technology has significantly advanced. How doo yoo doo - Neva thot I would see a headline like this - my head explodes.... Who'da thunk?! "The F-35 is sleek and stealthy, thanks to internally-carried weapons, but that limits [OOHHH spoiled it - buzzkill] the operational payload and the jet’s air-to-ground capability, correct? To some extent, that is true, but here’s an alternative view. “It’s a bomb truck, capable of carrying 14,000 pounds–that’s 3,000 pounds more than my F-18s,” said Lt. General Jon Davis, head of aviation for the U.S. Marine Corps (USMC). 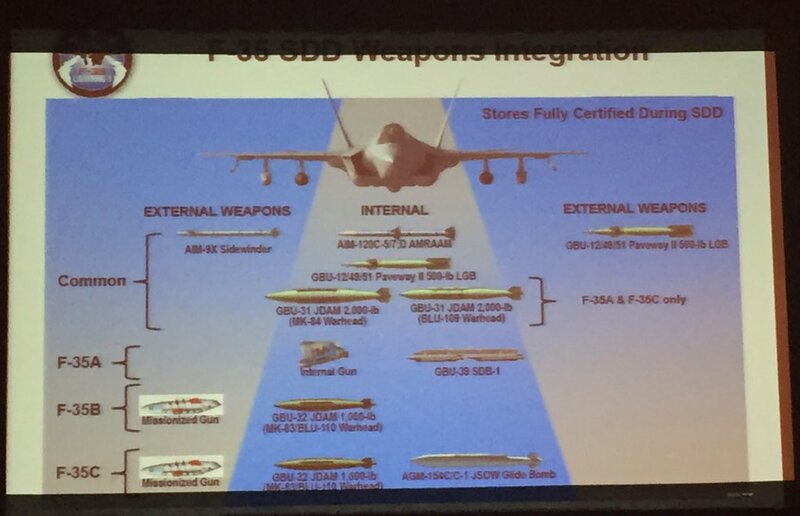 In fact, the F-35 has seven external weapons stations (see diagram). Their use is not part of the initial operating capability (IOC) for either the USMC F-35Bs or the U.S. Air Force F-35As. But a total of nine weapons are being qualified on the Lightning II as part of the system design and development contract that ends next year. More will likely be integrated in a follow-on contract for Block 4 software and capabilities, which has not yet been fully finalized. ...Not part of Raytheon’s display is the rival short-range air-to-air missile to the AIM-9X. This is the MBDA Asraam, which is going on to the UK’s F-35Bs. The UK is also looking for integration of the MBDA Meteor BVRAAM and the MBDA Spear smart bomb—but not until Block 4." Here are some clues about BLOCK 4 specifically 4.1 - as for the rest? Who knows... US Congress yabbayabbayabbas & does nothing but punt decisions down the field for continuing resolutions or somesuch & I don't care. "...Committee members also stopped short of mandating a separate programme for F-35 follow-on modernisation, but the bill will require additional reporting on the modernisation to Congress. The major defence acquisition programme designation requires closer inspection from Congress and a selected acquisition report detailing the programme’s cost, schedule and performance. ...Congress also softened its stance on the JPO, which McCain had threatened to scrap. Instead, the conference report directs the Defense Department to return within the next legislative cycle with recommendations on how to drawn down the office. Software and development will likely remain common across platforms, but some elements of the programme could be handed off to the services, staff say. “That actual disestablishment would not occur in [Fiscal Year 18],” staff say. “That would be a future decision.”"
spazsinbad wrote: Here are some clues about BLOCK 4 specifically 4.1 - as for the rest? Who knows... US Congress yabbayabbayabbas & does nothing but punt decisions down the field for continuing resolutions or somesuch & I don't care. Ah McCain, you haven't done it again LOL . Good thing there are people with a little bit more common sense than McCain in Congress. So no death ray for now. "House and Senate negotiators have finalized a $618.7 billion defense policy bill for 2017 that increases funding for military readiness and higher troop levels at the expense of proposed plus-ups for fighter aircraft procurement. The massive 2017 National Defense Authorization Act (NDAA) supports ongoing operations over new hardware, reorganizes the top weapons buyer’s office, and retains the F-35 Joint Program Office (JPO), senior staffers on the congressional armed services committees said Nov. 29. A House floor vote on the bill is expected on Friday, with the Senate following early next week. ...the bill includes compromise language directing the Defense Department to brief the defense congressional committees on their recommendation for eventually winding down the JPO, according to one staffer. The language does not include any hard dates for when the JPO must disband, the staffer said. Most of the JPO’s responsibilities will eventually return to the services, but Congress recognizes that certain things like software development and managing international partners will need to remain joint, the staffer said. Lawmakers also considered establishing a separate, standalone acquisition program for the F-35 follow-on modernization effort, called Block 4, which is currently managed by the JPO as part of the existing F-35 program. Some have argued this change would increase transparency and facilitate better oversight of the upgrade program, which is projected to cost $3 billion over the next six years. However, lawmakers decided to keep Block 4 under the F-35 program baseline, but add stricter reporting requirements. This serves to increase visibility without the bureaucratic headaches that come with establishing a new Major Defense Acquisition Program (MDAP), according to the staffer. JPO Chief Lt. Gen. Christopher Bogdan has said establishing a new acquisition baseline for Block 4 would add unnecessary cost and “easily” six months to a year of delay to the start of follow-on modernization." We have know about 4.1 through 4.4 for a while but had little details. At first, I thought that they were taking the existing Block 4 plan (from the Norway Doc) and streatching it out through 4 micro-blocks. However, looking at the initial 4.1 through 4.4 plan, I saw that they had put the plan for 6 AAMs in at 4.4 instead of 5, JSM at 4.1 instead of 5, etc.... so I knew that there had to be some kind of overlap. Looking at the latest DOT&E report sealed my opinion on the matter. Follow-on Modernization (FoM). The program continued making plans for all variants for FoM, also referred to as Block 4, which is on DOT&E oversight. The program intends to award the contract for the modernization effort in 2QCY18 with developmental flight testing beginning 3QCY19. Four increments of capability are planned, Blocks 4.1 through 4.4. Blocks 4.1 and 4.3 will provide software-only updates, Blocks 4.2 and 4.4 will add hardware as well as software updates. Improved Technical Refresh 3 (TR3) processors are planned to be added in Block 4.2. Note that TR3 was originally scheduled in Block 5 but got pulled up to 4.2 which fits inline with my theory of the JPO combining the previous blocks, or maybe they just did that with Blocks 4 & 5. The FY2018 budget docs coming next month will give us a better idea, but it looks like the blocks are separated by 18 months rather than the 24 month cycle of the Norway doc, but that may just be 4.1 & 4.2 (as that is all that is shown in the FY2017 doc). Is the AGM-158 JASSM in 3F or has it been moved to the right of 4? 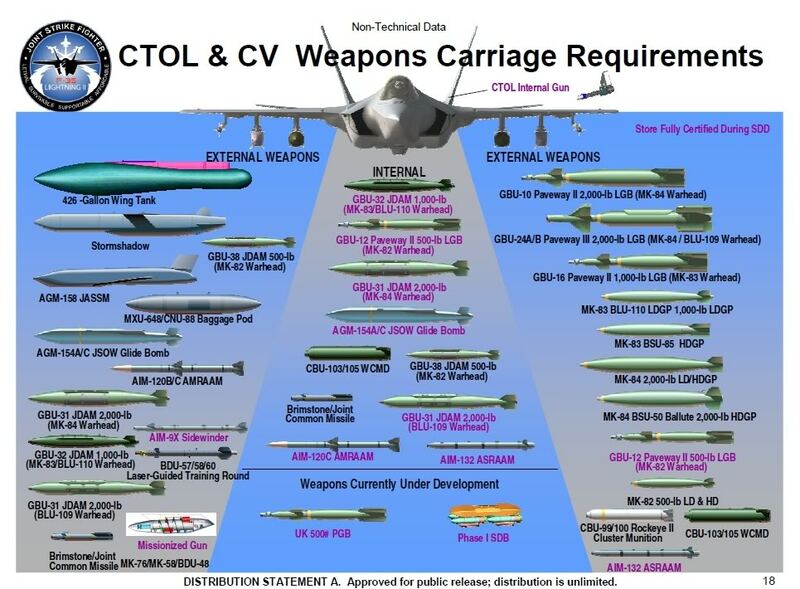 Once UAI is in the F-35 you will not see these types of "weapons tied to Blocks" diagrams for weapons that have UAI drivers, of which the JASSM family is one. 6 X AIM-120D by end-2017 ... nice. popcorn wrote: 6 X AIM-120D by end-2017 ... Nice. Um, I never said that. Minor note, but TR3 is a refresh of (at least) the F-35's Integrated Core Processors isn't it? If so, that appears to already be a Block 4 item in the Norwegian doc, under "Basics", "ICP Upgrade for Increased Communications". Or are you talking about some previous documentation that had TR3 in Block 5? Previous docs talked about Trs coming every-other block. The last one came in Block 3i so the next should have been 5. I think the Norway Block 4 ICP for "Comms" upgrade has to do with either increased encryption or enabling SATCOM where the full TR comes at 5. Looking at this chart, it looks like TR2 was to come as part of Block 2 but was pushed to 3i which may explain why they thought the next TR would be at 4. Hmm.. I interpreted that Norway graphic to mean Blk 5 completes OT&E in 2017? The "Original" plan was to have Block 5 in OT&E by 2017... But they are 5-6 years behind schedule for FoM. The F-35 joint program office anticipates having a Block 4 capability development plan approved by the Joint Requirements Oversight Council in April, about 16 months late, according to an official. Lt. Gen. Christopher Bogdan, F-35 program executive officer, told Inside Defense Jan. 24 after a presentation at National Defense University he anticipates the capabilities development document to be approved in March or April. The program initially expected JROC approval in December 2015, Inside Defense previously reported. The program has crafted a Block 4 strategy that would complete follow-on development in four increments: iterations 4.1, 4.2, 4.3 and 4.4. The first and third increments will be focused on software upgrades and the second and fourth on hardware. Some lawmakers and Pentagon testing officials have expressed concern that Block 4 has become a catch-all phase meant to deliver both new capabilities as well as capabilities deferred from earlier development blocks. Prioritizing those capabilities and attaching cost estimates has proven a challenge as the program seeks JROC approval. The JROC has been hesitant to support the incremental approach, Bogdan said, and argued it needs a life-cycle cost estimate for the entire Block 4 plan in order to conduct trades between funding and requirements. But Bogdan claimed it is too early to develop accurate life-cycle cost estimates that would actually be helpful in making those trades. The council also floated the idea of approving the CDD in four increments -- each with its own cost estimate attached. The JPO rejected this idea, Bogdan said, which resulted in a four-month stall to the CDD approval process. Bogdan confirmed the program would not submit incremental CDDs as the JROC initially proposed. However, in order to validate the requirements document, the JROC has stipulated both an independent cost estimate and a separate projection from the Pentagon's cost assessment and program evaluation office. The JROC's concern about approving an incremental Block 4 plan reflects a larger institutional hesitancy within the Office of the Secretary of Defense to approve incremental strategies, Bogdan said. According to Bogdan, some officials are concerned crucial warfighter needs may be in a subsequent increment that never gets funded. CAPE has also withheld support for incremental acquisition programs, Bogdan said, because it wants a solid cost estimate before signing off on a plan with many parts. Further, lawmakers typically do not endorse an incremental acquisition approach, Bogdan said, because it usually means early capability releases are sub-par and in some cases less reliable than gear in the field. However, Bogdan argued an incremental acquisition strategy is sometimes necessary, particularly in the case of Block 4, because prioritization is not only driven by need, but by the pace of development. In some cases, the warfighter needs the capability but the technological maturity has not materialized. In this scenario, an incremental approach allows a program to plan for the insertion of technology still being matured before it has details about how much those capabilities will cost. Once the JROC approves an F-35 CDD, the JPO plans to award a contract to begin executing the program in mid-2018 and developmental flight testing will follow in late 2019. Block 4.1 is planned for delivery in 2021. 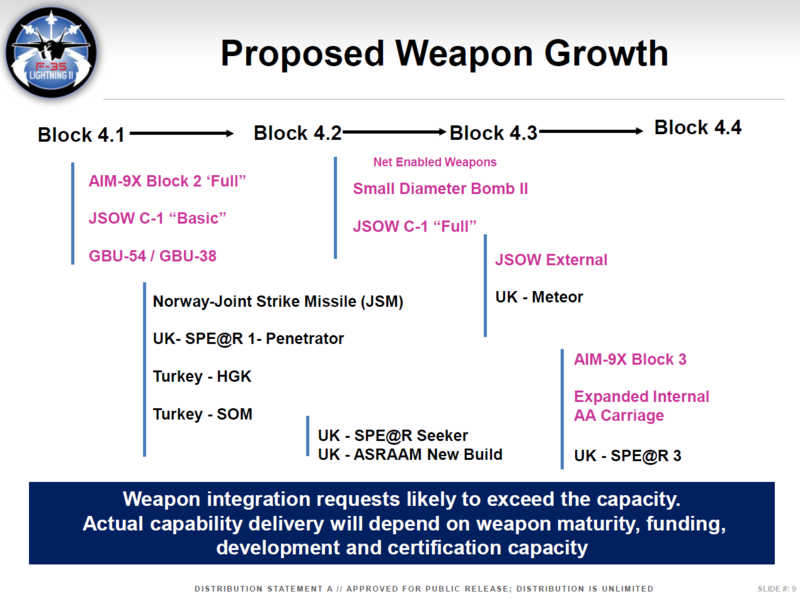 In his most recent report to Congress -- and his last as director of the Pentagon's operational test and evaluation office -- J. Michael Gilmore pointed to potential risk in the JPO's plan for Block 4, arguing that the development and test schedule is too aggressive for a program that seeks to incorporate a growing slate of technical requirements. The plan, he said, does not incorporate lessons learned from earlier F-35 software development and from the F-22 program. "Attempting to proceed with the current unrealistic plans for follow-on modernization would be to completely ignore the costly lessons learned from Block 2B, 3i and 3F development, as well as those from the F-22 program," he said. Gilmore highlighted what he sees as "insufficient" time to conduct operational test for each Block 4 increment. He also raised concerns about inadequate test infrastructure to support follow-on capabilities. The program currently has 18 developmental test aircraft and 1,768 personnel; that support is expected to shrink to just nine aircraft and 600 personnel for follow-on modernization. "Clearly this plan is grossly inadequate," he said. Some of that inadequacy may be owed to ongoing analysis within the services. The Air Force and Navy are both in the process of completing independent studies of Block 4 test infrastructure. AvLeak is reporting to day in an article about the JASSM-ER that it didn't make the cut for Block 4 in the F-35A. Given that JASSM-ER is UAI then the only thing that I can think of is that UAI will be in 4.2. SpudmanWP wrote: Given that JASSM-ER is UAI then the only thing that I can think of is that UAI will be in 4.2. Operators of Lockheed’s F-35A and carrier-based F-35C will also be watching the early performance of the JASSM-ER. The weapon did not make the cut for the F-35’s Block 4 follow-on modernization program, and it will instead be considered for the next iteration, Block 5, in the mid/late-2020s. I was suggesting that JASSM is the reason that the AF stopped procuring JSOW. The Navy's decision to skip JASSM/JASSM-ER defies reason. marauder2048 wrote: The Navy's decision to skip JASSM/JASSM-ER defies reason. I'd say most of what the Navy does defies reason. ....why focus USN development on JASSM when they are completing LRASM (JASSM+) for the SBug. ...the USAF is bringing JASSM to the F-35A/B/C, so both the planes being replaced (F-16/18) now have JASSM. ....will one size fit all, with UAI?? JASSM-ER is ~ $1.2M/unit. LRASM is about $3M/unit. moving up the inclusion of Auto-GCAS. Block 4.1? The F-35 Joint Strike Fighter program expects to meet with Pentagon leadership in early December for approval of a new plan that will allow it to continuously develop software capabilities following completion of the post-system development and demonstration phase. F-35 Program Executive Officer Vice Adm. Mat Winter told reporters in September he expected that approval to come in October. Air Force Brig. Gen. Eric Fick, F-35 program deputy, told Inside Defense Nov. 15 that while the program expects approval for its new post-SDD strategy, the upcoming Defense Acquisition Board meeting is not solely focused on Block 4 follow-on modernization. It is part of the program's annual update with Pentagon acquisition executive Ellen Lord. "It's giving her that look across the entire program, laying out the process that we intend to follow as we march forward in modernizing," he said. The JPO will present a cost estimate for Block 4 during the DAB meeting, but an updated figure is being finalized as part of the fiscal year 2019 budget process, Fick said. Inside Defense first reported in September the joint program office was adapting its strategy for post-SDD and follow-on modernization, a move that could change the way it develops and delivers new software capabilities. The new strategy would establish a bridge period between delivery of the final version of Block 3F software the program plans to release during development and the start of Block 4 follow-on modernization. The program expects to deliver all Block 3F capabilities in "early 2018," Fick said. However, the software will have a number of known deficiencies that will not be addressed by the close of SDD next year. The bridge phase would allow the program time to address those deficiencies and incorporate fixes discovered during initial operational test and evaluation, which is slated to start early next year. Congress has been waiting for months on the JPO to provide a detailed plan for Block 4. Under the Fiscal Year 2017 National Defense Authorization Act, the report was due in March. Wouldn't be surprised if AutoGCAS makes it into an OFP before Block 4. WASHINGTON — The F-35 program office plans to close out the joint strike fighter’s development phase this year and begin moving into modernization, but it could face an uphill battle, the Pentagon’s head of weapons testing warned in a report released Wednesday. The F-35 Joint Program Office has known since 2016 that it likely wouldn’t be able to make its October 2017 goal post for wrapping up developmental test flights, instead estimating it would take until February or even May of this year to finish those tests and end the system development and demonstration, or SDD, phase. That means initial operational test and evaluation, or IOT&E — the last milestone before full-rate production starts — won’t be able to begin until late 2018, Robert Behler, the Defense Department’s new director of operational test and evaluation, said in his office’s annual report. The F-35 joint program office announced today it has approved a plan to install automatic ground collision avoidance software on the Joint Strike Fighter five years ahead of its original schedule. Inside Defense first reported in December the program office was awaiting a decision from the configuration steering board to finalize the plan. In a Jan. 30 press release, F-35 Program Executive Officer Vice Adm. Mat Winter said the program plans to field the new technology by 2019. The program had expected to incorporate Auto GCAS during its Block 4 Follow-on Modernization phase. However, as part of its new Continuous Capability Development and Delivery effort, the program is looking to incorporate new capabilities, like Auto GCAS, as well as fixes to already fielded software. AutoGCAS integration onto most of the tacair fleet should be a priority. CFIT needs to become a thing of the past. "​The F-35 Joint Program Office announced it will implement anti-ground collision software into the fleet five years earlier than planned. The new system is designed to determine when impact with the ground is imminent, and automatically maneuver by initiating a 5-G pull to recover. The software uses GPS position and system altitude, compared to an onboard Digital Terrain Database...."
Aiui, operators pushed this left. 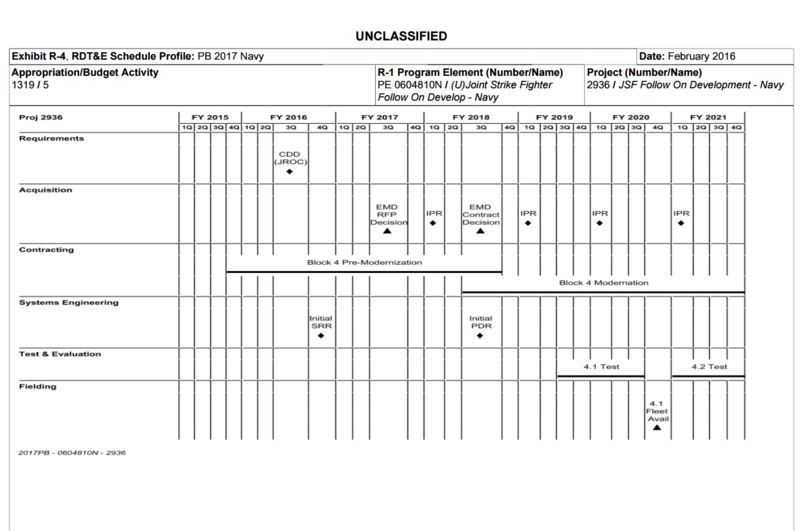 F-16 implementation technical baseline, NRE paid by LM. ...Officials with the Joint Program Office did not immediately provide responses to Military.com questions about which aircraft squadrons or which variant would be the first to receive Auto-GCAS. But it's supposed to be installed across the fleet by 2019. The program executive officer for the F-35, Vice Adm. Mat Winter, said officials estimate expediting the technology, given existing statistics, will save three aircraft and three pilots. "Our acquisition team is working with the warfighters to ensure Auto-GCAS is in every F-35," Winter said in a statement. "... Over the service life of the F-35 fleet, having Auto-GCAS is estimated to prevent more than 26 ground collisions from happening."" Israel Defense Directory 2015_16.pdf (43Mb) single page PDF from directory attached below. popcorn wrote: What about a scenario, rare as it's likely to occur, where for some reason a F-35 engages a bad guy WVR and chaff allows an extra measure of protection vs. RF missiles? And as such I guess that in situations where your scenario could eventually happen, "stuffing" Chaff and Flares in the same dispenser would indeed make sense. Or beast mode f35 engaged by pop up threat. Here is another article on ground collision avoidance software. "“It takes three years to build a fighter jet; it takes 26 years to build a fighter pilot. I can give you the price of an F-35, but … You can't put a price on your sons and daughters," said Lockheed Martin experimental test pilot Billie Flynn. Flynn worked on one of the upcoming advancements for the F-35: an automatic ground-collision avoidance system (AGCAS). Currently on the F-16, for which Flynn also worked on it, the system does pretty much what its name says: automatically avoids the ground when necessary. To date, it has saved the lives of eight pilots (but only seven jets). ...One of the things that has expedited AGCAS’s move from the F-16 to the F-35 so much is the high quality of F-35 simulators, according to Flynn. But that doesn’t mean no actual testing is required. And that’s a tough prospect because you don’t want to send pilots spiraling at the ground in a fighter jet too often hoping the jet pulls them out. The solution is to trick the system. Normally, the AGCAS activates at 2,300 feet. For testing, Lockheed adds 10,000 more to that floor, so the F-35 thinks it is close to the ground when it gets to 12,300 feet and pulls up. That way, testers can make sure it recognizes altitude and reacts appropriately without putting a test pilot in a situation where the AGCAS is the only thing preventing him from crashing. Beyond the delicate balance between safety and not wresting control away from a pilot unnecessarily, another concern is electronic warfare. If a system can take over piloting the plane, is it exposing the jet to danger from hacking? Not according to Flynn. 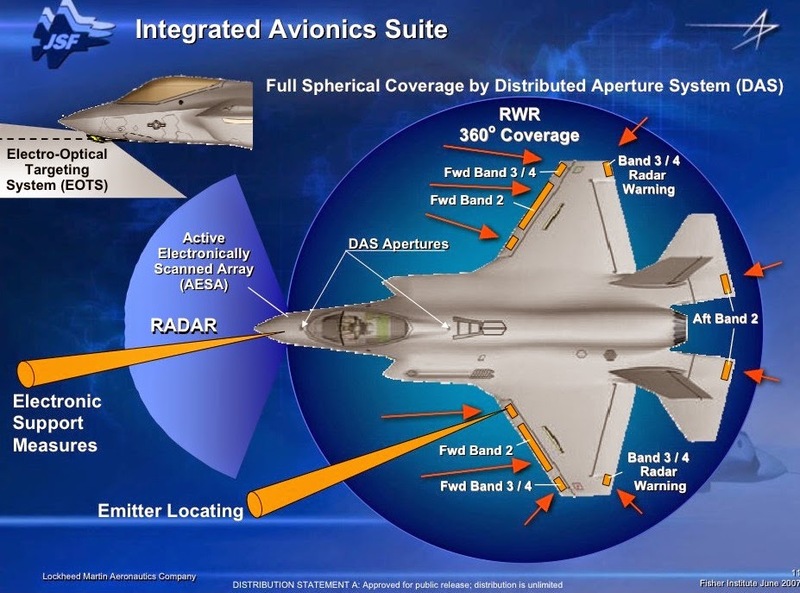 Lockheed still needs to do live testing with the AGCAS in the F-35 before implementation. Flynn is confident, though. And once that is completed, the process is quick. “Once we're happy, it goes into all the jets as fast as possible. It's a software drop. It’s like updating your iOS." Andrews noted the program is expecting an independent cost estimate to be completed this fall. No worries...it's bound to be leaked soon enough. Haven't been able to find too much on this. Does anyone know what the specifics are on these new "panoramic displays"? I think it will be an update of the same size. Maybe OLED with a higher pixel & color count. ...The goal of this F-35 Display Technology Improvement program is identify, develop, and integrate technologies to achieve a threshold (objective) 84 Hz (108 Hz) update rate, 8 Mpx (32 Mpx) image resolution, 600 fL (1200 fL) sustained day luminance, 0.01 fL (0.001 fL) night luminance with electro-optical emissions compatible with digital and analog helmet/cockpit-mounted cameras, advanced touch screens compatible with flight-gloved hands, 2X (4X) less net power via higher efficiency materials and energy re-cycling, advanced heat transfer and storage materials, lower weight substrates and structural housings. The main focus is on improvements for the 20x8-in. primary multifunction display that can demonstrate life-cycle cost (LCC) or warfighter effectiveness improvements that would justify switching the from the current circa 2004 AMLCD designs to incorporate manufacturing technology improvements available in circa 2016 components...." READ MORE AT THE JUMP http://www.zyn.com/sbir/sbres/sbir/dod/af/af151-020.htm [no longer here] or at previous forum post above. 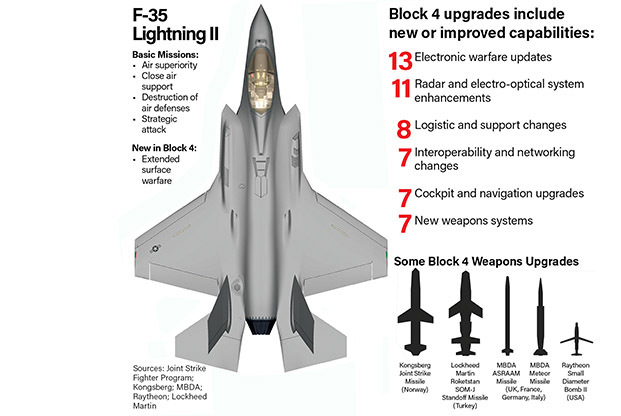 Lockheed Martin is being awarded with a contract modification in support of the F-35 Block 4 pre-modernization Phase II effort. Priced at $130.4 million the modification external link provides for requirements decomposition and design work that sees for the maturation of the aircraft’s weapon capabilities. Block 4 is part of the F-35 JPO’s Continuous Capability Development and Delivery or C2D2 external link effort that seeks to keep the fighter jet relevant against emerging, dynamic threats by quickly fielding incremental updates to the jet’s software, much like regularly updating one’s smartphone. The Block 4 update program will allow the aircraft to finally meet its full contractual specifications. The whole Block 4 update program is expected to cost $10.8 billion through FY2024. The contract combines purchases for the Air Force ($17.4 million), the Navy ($14.2 million), Marine Corps ($14.2 million) and for relevant international partners ($84.3 million). Work will be performed at Lockheed’s facility in Fort Worth, Texas and is expected to be completed in March 2020. "Lockheed Martin Corp., Lockheed Martin Aerospace Co., Fort Worth, Texas, is awarded a $130,359,625 modification to a previously awarded cost-plus-incentive fee contract (N00019-18-C-1004) in support of the F35 Block 4 Pre-modernization Phase II effort. This modification provides for pre-modernization requirements decomposition and design work for Block 4.1 Partner participant weapon capabilities for maturation to an air system requirements review level of maturity. Work will be performed in Fort Worth, Texas, and is expected to be completed in March 2020. Fiscal 2018 research, development, test and evaluation (Air Force, Navy); and non-U.S. Department of Defense (non-U.S. DoD) participant funding in the amount of $90,505,737 will be obligated at time of award, $13,262,261 of which will expire at the end of the current fiscal year. This modification combines purchases for the Air Force ($17,557,293; 13.5 percent); Navy ($14,223,730; 10.9 percent); Marine Corps ($14,223,730; 10.9 percent); and the non-U.S. DOD participants ($84,354,872; 64.7 percent). The Naval Air Systems Command, Patuxent River, Maryland, is the contracting activity." I don't fault DiD for changing (ie editorializing) on the $130mil award. I have a problem with the moving of the goalposts from Block 3F to now Block 4 in order to meet "contractual specifications".